Where have all the Robins gone? Today I was digging up tree roots. Fifteen years ago such activity would have been accompanied by endless whirring of wings and fierce comments if I was too close to a juicy vine weevil. I always used to have at least two in attendance, and once six! (presumably a family). In an hour of work today I saw none at all. Yet they are there in the garden, as I see them on the feeders. I can’t believe they prefer dry grains to live tidbits and I am sure they have not turned vegetarian. 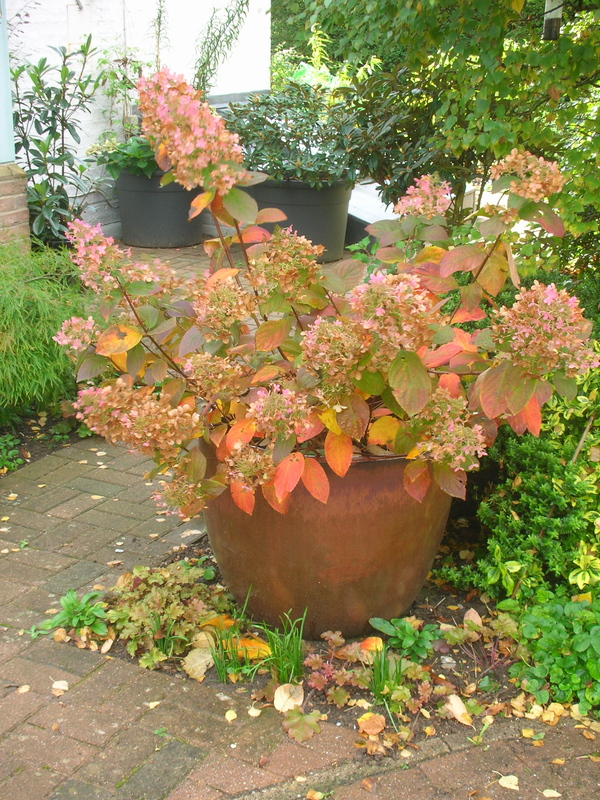 I worried that this Hydrangea paniculata pink diamond (white flowers fading to pink), might not work in this big glazed brown pot. Guess I was wrong! This entry was posted in Gardens and tagged bird feeders, Hydrangea paniculata pink diamond, Robins, vine weevils by hilarycustancegreen. Bookmark the permalink. and driving about in vehicles in the small hours. I love their song, it’s so liquid. I’m sure you’re right. I’ll make less noise next time. I never knew they would sing in the night. It is interesting that I was working so happily, but feeling something was missing and realised it was the sound of their wings and comments.